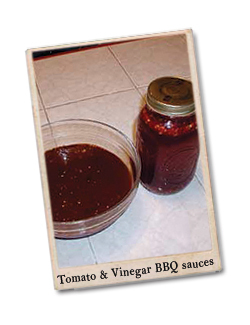 Vinegar based BBQ sauce, one of the two standards for BBQ, the other is the tomato based BBQ sauce. We like to toss pulled pork in the vinegar based sauce and put the tomato based sauce on top of the sandwich. However you like it both these sauces are standards for BBQ. Mix together in a jar and let stand overnight. Shake every so often. Toss into freshly pulled pork. You can also put split fresh chilies in this recipe for really spicy sauce and you can add more sugar if you prefer it sweeter.